Wizard Island and Crater Lake from the water's edge. 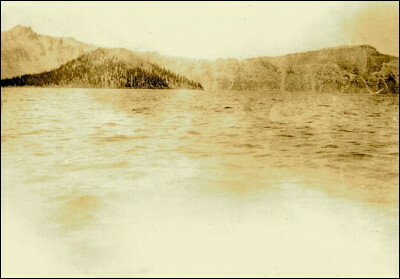 This was taken in 1925 by my grandfather Frederick Armstrong Daugherty on one of the many family trips to Crater Lake. The view is from the bottom of a trail from Crater Lake Lodge on the rim to the water at Eagle Cove. This is a rare photo as this trail was only in use from 1918 to 1927. In 1925 the trail was described as "more than a thousand feet straight down, but by the exceedingly devious trail the distance is much greater. The downward trek is strenuous and the return still more so.... In many places the trail was covered by huge snowbanks which had lingered during the whole summer, and these, with the puddles of mud and water, often made considerable detours necessary." It was noted that horses and burros could be hired for the trek but that none of the animals particularly liked the trail. A new "zig-zag" rim-to-water trail was used from 1927 to 1959, and then in 1962, the Cleetwood Cove Trail was opened across the lake, and is still in use.